“You’re Drugging Your Dog? !” “I think bonding time is more important than his hip.” “He’s been neutered? Already?” “Look how dominant he is.” “That’s what happens when you don’t go through a breeder.” I even got lectured for even getting a dog. From people who had gotten dogs themselves in the past with absolutely NO say so or input from me at all. It’s amazing how everyone has an opinion…and I assume they’re well-meaning in their own way. If you’ve been following my posts for the last few weeks, you might realize I’m talking about Chance and heard about how he came to me. I was able to learn a bit more about him from the Humane Society. The poor guy had been passed around three or four times and ultimately brought in at about 8 weeks by a woman who said, “We just haven’t bonded.” I’m so glad she was honest enough and brave enough to give him up. At the Humane Society, because he hadn’t had his shots, he was isolated and carried outside to do his business. And then the day before I was to pick him up, neutered. He was so excited when we got him home, just a little afraid of the grass and a bit tumbly wumby like puppies can be – their little legs can move faster than their bodies – but observing him, I noticed something didn’t seem quite right with his right hip and leg. Chance had to go in a small kennel so he couldn’t jump – he could have layed the long way but seems to enjoy sleeping in weird positions. In to our fave veterinarian he went first thing the next day – the vet who saved My Gibson more than once and put up a heroic fight for him at the end. A slight separation of the growth plate was the verdict. A few shots and other indignities culminated with a cone – oh the cone of shame, so he couldn’t lick his stitches from his neutering. No jumping, no running. Close confinement. Drugs for the pain & to take the edge of his excitement off and keep him quiet. Carrying in and out to the yard (or bending over shambling alongside him to keep him from jumping) just about every hour – in effect, the same treatment he got at the Humane Society. Except he was getting heavier and heavier! In the first week he went from 17 pounds to 25, and this went on for almost three weeks. Chance – thinking about going in for a rock. And those who criticized and carried on just couldn’t seem to get that if Chance’s hip didn’t have a chance to mend, it would mean surgery and pins which would ultimately mean more confinement and more drugs. Talk about being cruel to be kind. In effect, I had to do everything “wrong.” No socialization, no puppy classes, no obedience, no walks or mixing with other dogs. No running, no jumping, no stairs. He was crazed and turned into a barking, biting “land shark.” I was literally black and blue. He’d turn on me and give me a bite (not viscously, but puppy playing) and I couldn’t get my hand through to his mouth to remove those razor-sharp teeth because the cone was in the way. I don’t know what it is about these rocks! And the advice poured in, mostly put him on his back or pin him to the ground – which sent him into a violent frenzy. The few times I tried it, he would go on for about 45 minutes of struggling, growling, barking, then crying and finally on to the most pitiful howls before he’d give in. Then he’d be right back at it. It was just not working and seemed to be making matters worse. I’m assuming he was “punished” this way (and maybe by a woman, because he acted differently with men) and perhaps that led to his hip injury. We had to find our own way, which meant I had to earn his trust. It wasn’t easy, but we worked (and are still doing so) through it. Patience and a special “hold” the vet showed me, pats and treats and cooing and encouragement during the good times & a lot of pretty mean, stern talk when called for. See, there he is at the rocks again!! With all this, it’s no wonder the poor guy was frustrated, and all I could hope for was that when Chance was finally freed, able to move around and off the drugs, he’d be able to work off some of that puppy energy and those puppy crazies! And boy, did he ever! He zips around like a maniac. He goes after everything that moves. He chases butterflies, moths, and just about any bug. He loves to mess with the plantings in the yard and has this thing about picking up the rocks that line the patio and carrying them off to his favorite tree. Then he jumps on the rock with both front paws. I put the rock back and he finds the exact same rock again. And repeats. Here, he’s just eating grass! But you know he really wants a rock…lol! He’s growing like a weed and learning a few commands. He’s absolute trouble, but in a more normal puppy way. At least I hope so. There was the day he grabbed my bathrobe and turned so quickly in a frenzied circle with it that he had practically entombed himself in the center. Then he climbed out and humped it. I shudder to think what that might mean. And then there was the day he launched himself at me and bit me in the behind. My son said, “Mom, your dog is kind of an A**.” And yeah, he is! That’s what puppies are. He’ll look right at me with that twinkle in his eye and a big grin on his face. And do exactly what he’s not supposed to. And by the way, Homer still hates him and has learned to find high perches. Oh! Thanks for sharing the adventures of your new Fur friend. My pleasure! I decided I’m going to do a post around each month – like a diary, so I don’t forget how precious he was and can update everyone! It sounds like you are doing a fantastic job. And you have the patience of a Saint! I have never been great at handling puppy energy, so I just rescue the older dogs that have out grown some of that energy. I am sometimes envious of the cuteness that I miss because of getting my dogs older. But, kudos to you. I LOVE his face…. and those eyes!!! I haven’t had a puppy since my 1st dog in 81 or so – I thought when the opportunity came up from the Humane society I’d go for it! My other dogs have been older rescues, the last came from a family in GA where he’d lived in a garage. I thought it might be nice to work with a younger dog for a change and sad to say, but hopefully have him around a bit longer (it’s so heartbreaking to lose them) and maybe have the opportunity to have a dog w/o so many issues as my last two and raise him up “right.” I’m dying from tiredness, lol! Just this week he’s losing his puppy fat – having a growth spurt. The pictures, 10 days apart look like two completely different dogs!! He is so cute! It’s hard when our puppies are injured or sick. They don’t understand. Hopefully things will settle down for you soon. Thanks, Virginia – it’s a challenge! 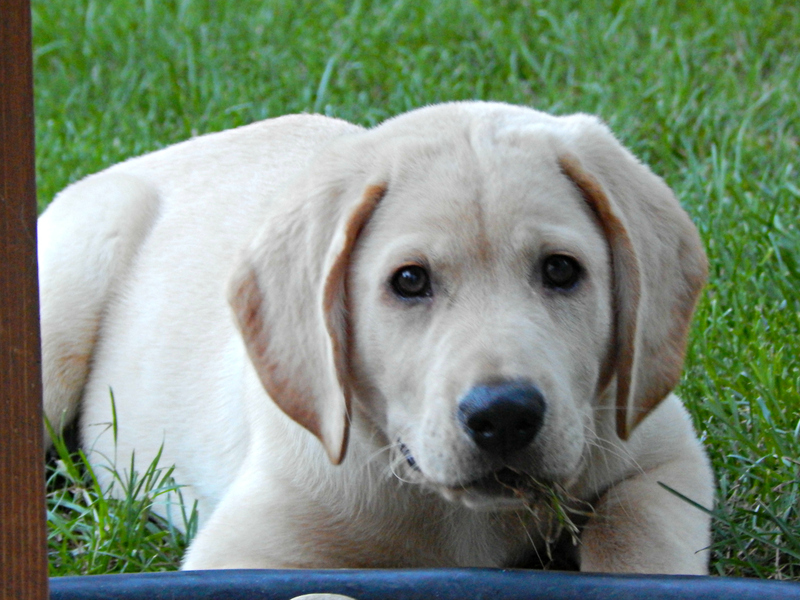 I used to joke when I’d meet people with lab puppies when I had my Gibson. They’d ask how long it took for a lab to settle down – seven years was always my answer! Yes the whole 3 years and dogs settle down seems to be a myth. At least with my two dogs! I commend you for all you have done for this poor pup! Stand strong. Sounds like he needs your love! Thanks, Carrie! I think you’re right, and I appreciate the encouragement – it means a lot! 🙂 I just realized I haven’t stopped by your blog for some time! I hope you’re still visiting fabulous places in the TC!! 🙂 We sure do! But I’m really a dog people, and a cat people and sometime a people people, too!! He’s such a busy little guy. And he’s been swimming twice this week – took to it like a lab to water! He needed you, Mollie. If anyone can bring him around, it’s you. He does have that devil sparkle though, does he not? 🙂 Such a darling! Hi Nancy, he really does! My first pup must have been easy, or I was just so much younger (about 21) and had so much more energy, or it was so long ago that I can’t remember or so traumatic, like childbirth, that I’ve blocked it. That pup I had, I think, about 7 or 8 weeks. But then each little pup is different and this one is off to a rocky start. Lucky dog to have found a home with you! Trust your vet and your instincts, this will turn out to be a bonding experience for you all. Hang in there, puppy hood is over all too soon. Thanks, Liz! That’s what happened with the pin and the hold. I’ve also learned to watch his little eyes – if there’s any white showing around them…look out!! You did what you had to do, I had a similar thing happen years ago with a Shar pei that I had, he had terrible entropian and had to have eye surgery, he had to wear the cone of shame for a long time and remain somewhat sedated and he was only a puppy. So I know whereof you speak. So glad that Chance is with you, I love puppy energy when they get older you look back on it and miss it. He sounds like a wonderful boy and you a great pet Mom. I am so pleased Chance has found his ‘forever’ home. Shame, he certainly did have a rough start to life, but since being with you, and being cared for and loved all is coming right. Looking forward to more updated on Chance. Thanks much and he is FUN a lot of the time. ANd big hugs back to you. I’m so sorry to read what you and baby Chance have had to go through, poor boy. But how wonderful that there is a positive outcome! And now it sounds like he’s just being a typical puppy!! Lovely! I hope his hip continues strengthen. Always interesting when people feel the need to share their (unsolicited) thoughts isn’t it….?? You surely have your handful with him, but he is just too sweet, I wish I could cuddle him. JS and I we would love a couple of dogs again, but……the rules here say “no animals of any kind allowed” in this complex. 😭 Miss my 2 dogs still very much, but they have and a long time ago now up to dog paradise. You will win his trust eventually, it will just take time, perseverance and love.